First stop is Sumburgh Head with plenty of Guillemots, many with white spectacles, alongside Razorbills, Fulmars, Kittiwakes, Shags, Arctic Terns and Puffins, while Great Skuas patrol ominously overhead. We also see Wheatear, Rock Pipit, Hooded Crow and a flyover Twite. The nearby Pool of Virkie produces two Arctic Skuas and close views of a mixed group of Ringed Plover, Dunlin, Sanderling and Turnstone in smart breeding plumage, along with a few Bar-tailed Godwits, a Redshank, a Knot and a Curlew Sandpiper developing a rusty flush. Next stop is the Loch of Spiggie where hundreds of Great Skuas are having a bath, a pair of Ravens is hanging on the breeze, while a family of Whoopers with six cygnets sails proudly on the blue water of the loch. Incredibly, a Crane appears above the north end of the loch and drifts away to the south as it gains height, which is a really lucky unexpected sighting. We also find the first of many Eiders in the bay here. A little further north, we count thirty three Common Seals, plus three larger Greys, on the beach at Scousburgh Bay, and then cross the 60° north parallel on the way to the hotel in Scalloway, bathed in glorious evening sunshine. It’s 10°C on 1st June, and we take the 10am ferry from Lerwick across to Bressay, spotting Black Guillemots from the harbour wall. On Bressay we enjoy roadside views of a pair of Red-breasted Mergansers and then a pair of Red-throated Divers, before crossing the narrow sound to Noss, by Zodiac piloted by the warden, where the only other traffic is a constant stream of Shags and Arctic Terns. On the east side of the island the vertical cliffs of the Noup are plastered with tens of thousands of noisy Gannets, while others cruise by at fairly close range. What a breathtaking site this is. 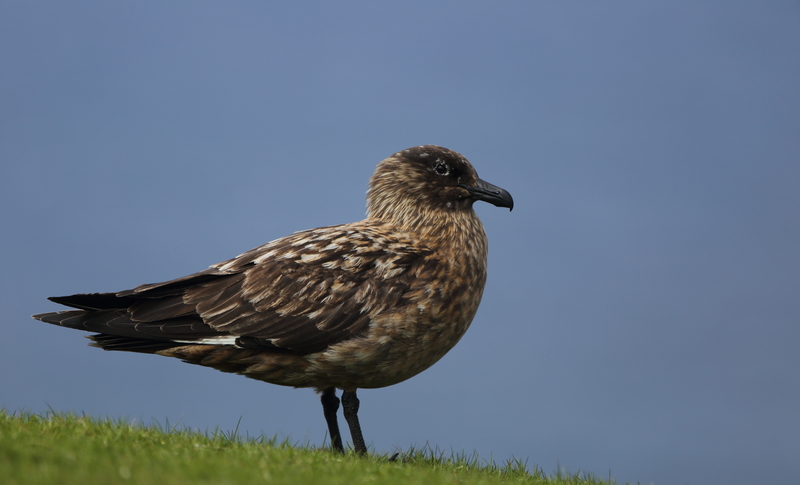 On the walk back from the ‘brink’, we count twenty five Grey Seals grumpily sharing the same small rock, enjoy an aerobatic display by a pale phase Arctic Skua and scope a posing Twite. Sadly, the after dinner sailing to Mousa is cancelled due to the wind. Heading north along the spine of the ‘Mainland’, through improving drizzle and a very stiff north wind, we begin with a Great Northern Diver in superb monochrome breeding plumage, not far out on Olna Firth, shortly followed by a pair of Red-throated Divers close enough in to show their deep red throats. Driving up the west coast of Yell, we follow signs to the beach at West Sandwick, where the sun comes out while watching Arctic Terns and Arctic Skua, clean looking wild Rock Doves and another close Twite. A second ferry takes us to Unst, where we find a beautifully marked Golden Plover right beside the road, along with a family of Redshanks, and as one of the fluffy chicks strays onto the road, it is forced sideways across the road by the strong cross wind. Meanwhile an adult Snipe with two chicks crouch and huddle together next to the road, relying on their remarkable camouflage to evade the watchful eyes of passing Ravens. By the time we get to the beautiful beach at Lunda Wick, washed by waves of clear blue water, even hats are flying away with the strong wind, and it’s a challenge to stand up straight! It’s ‘wall to wall’ blue sky all day long today, in sharp contrast to yesterday morning’s ‘fifty shades of grey’! An exhilarating ferry ride, with rainbow coloured spray, takes us to Fetlar, the sixth and final island on our Shetland adventure, where one of our target birds is Whimbrel and we soon find just one, which makes me worry about where his mates have got to. As well as Whimbrel, Fetlar is home to most of the British population of Red-necked Phalaropes, and although the Loch of Funzie is supposed to be the place to see them, there is no sign on the windswept loch, although we do get very close views of three Red-throated Divers. As we approach the nearby mires, a dainty little wader pops out on a small pond, and we just have time for everyone to see her red neck in the scope before she disappears into the vegetation never to be seen again today. Moving on, other good sightings include plenty more Snipe and Dunlin, nine Golden Plovers in one field and at least a hundred Great Skuas on Papil Water, next to another beautiful sun-drenched beach. Back at the ferry terminal we narrowly miss seeing an Otter by literally seconds! 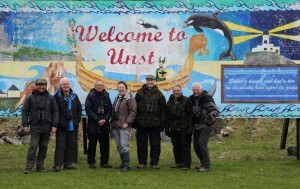 Returning to Unst, the Swallow here is possibly Britain’s most northerly individual! The relentless north wind continues, but undaunted we head for the UK’s ‘top end’, beginning with a photo shoot of the famous bus shelter, just round the corner from the hotel, adorned with everyday paraphernalia, where a waist high model Puffin waits for the bus that never seems to come! Next stop is the Herma Ness National Nature Reserve, where a walk of about an hour through ‘Bonxie Land’, leads to spectacular cliffs, stacks and arches, white with Gannets in their tens of thousands (around 27,000 pairs), a sight with a high ‘wow factor’. To the north is a stunning view of the Muckle Flugga lighthouse and Out Stack, the most northerly point of the British Isles, and a long way from the Bishop Rock in Scilly where some of us have also birded together! 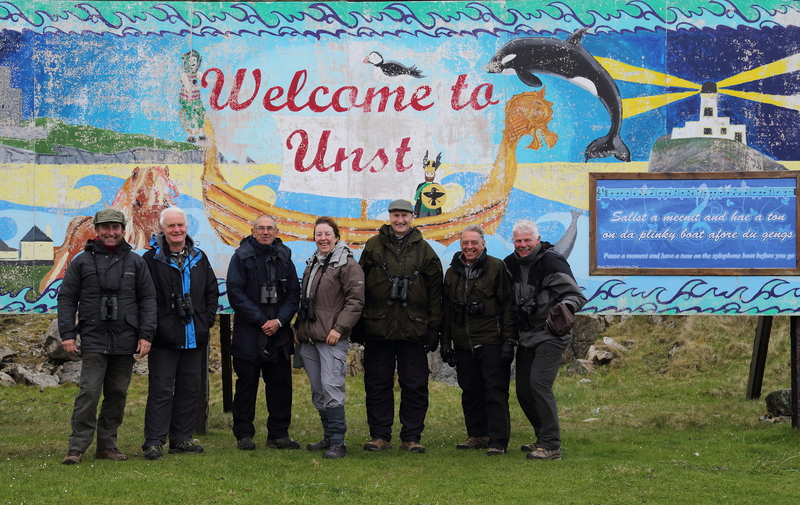 Having ‘done’ Unst and Fetlar, we retrace our route across Yell, with another Whooper on a pond at West Sandwick and brief views of an Otter while waiting to board the ferry from Yell back to the mainland. A brief stop at the Loch of Vatster, produces a Whooper on a nest, while the partner takes flight from the loch and lands in the adjacent meadow to shoo away the sheep! Further south at the Loch of Tingwall, we find another three Whoopers, making six for the day, as well as two pairs of Goldeneye and great views of one duck and two handsome drake Common Scoters, bringing the trip tally to 64 species of birds. Back at the Loch of Spiggie with the temperature now at 15°C we sunbathe while having a picnic at an idyllic cove with a cobalt blue sky, a sapphire sea and no wind! What a lovely end to a fantastic Shetland adventure in the sunny ‘simmer dim’.